Does exactly what it says on the packet. Just what you’d expect – they’re little, taste of caramel, and a little salt. 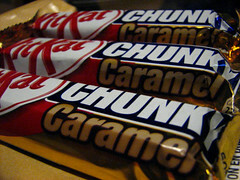 I don’t really rate the caramel flavour here. I know caramel is effectively burnt sugar, but there’s rather too much emphasis on ‘burnt’ here, to the extent it’s rather acrid, burns the throat a little. 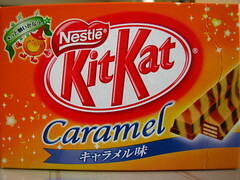 Where KitKat’s “Salt With Pretty Much Anything” phase met the current “Weird Incarnations of Caramel” phase. Actually not at all bad. Without the salt it’d probably just be unbearably sweet. Meh. It was alright. 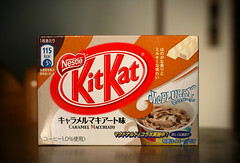 But a coffee flavoured KitKat needs to be milk chocolate, not white chocolate-substitute. It claims to be some sort of colaboration (コラボ – Korabo!) with M*Don*lds, and appears to be whizzed into a current version of the McFlurry, or Makoo-fooroory, as it would sound in Japan. 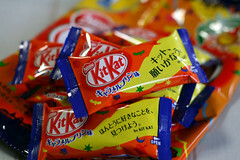 I’m not sure there’s really any connection between caramel and Halloween, but someone at Nestle Japan seems convinced otherwise. 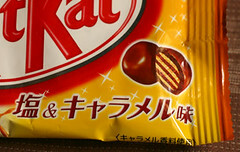 On top of that, these KitKats come with inspiring little messages like “Your dreams can come true” and other assorted tripe. Any resemblance to actual Halloween would presumably be entirely unintentional. 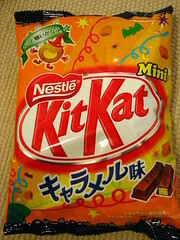 A very special KitKat indeed. 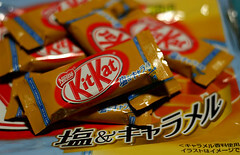 Strong caramel aroma, and rich creamy praline-like flavour. And they’re stripey! I must have worked my way through a dentist’s dozen of these. For the sweet of tooth, certainly, but fortunately I fit that profile quite comfortably. And in case the full-size ones didn’t fully satisfy (which of course they did), there is emergency back-up available in the shape of the mini multi-pack. And let’s not forget, though we almost did, that these were a special Halloween edition, hurried out a full four weeks before the day. Or Exotic Sakura Assort, to give it its proper title. 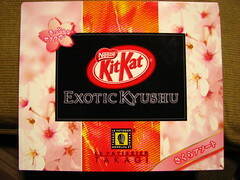 Each of the four regions now has a Sakura version of the Exotic collection, meaning half the box contains the “caramel white chocolate with orange and mango” that dissolved my teeth before, and the other half is those delicate pink cherry-flavoured ones. All rather excessive, if you ask me. I’m not quite sure what the idea is behind this version, but when it comes to entirely unsuitable and random flavour combinations that leave us wanting less, it’s what we’ve come to expect from anything with Takagi’s name on it.